Love this box by Nöje! Nöje (No-yeh) actually means pleasure joy and happiness in Swedish. Love it! Second company I’ve heard of now that has a Swedish inspired subscription box name! The Swedish are on to something! This subscription is one I could see myself falling for and indulging in for sure. Packed with full sized craft batches of coffee, tea, chocolate, honey and more! These 4 items may be popular as an add in for some boxes but this box actually specializes in these products, finding you only the very best. What’s in this box? 1. Adagio Teas pumpkin spice – mmmm never tried pumpkin spice tea before and was happily surprised! 2. Bee Raw Maple Blossom Honey – can’t have my tea without honey! I was just getting low too, perfecto! Love this maple blossom flavour too, and that it’s 100% raw, perfect for my morning granola and my pb on toast! 3. 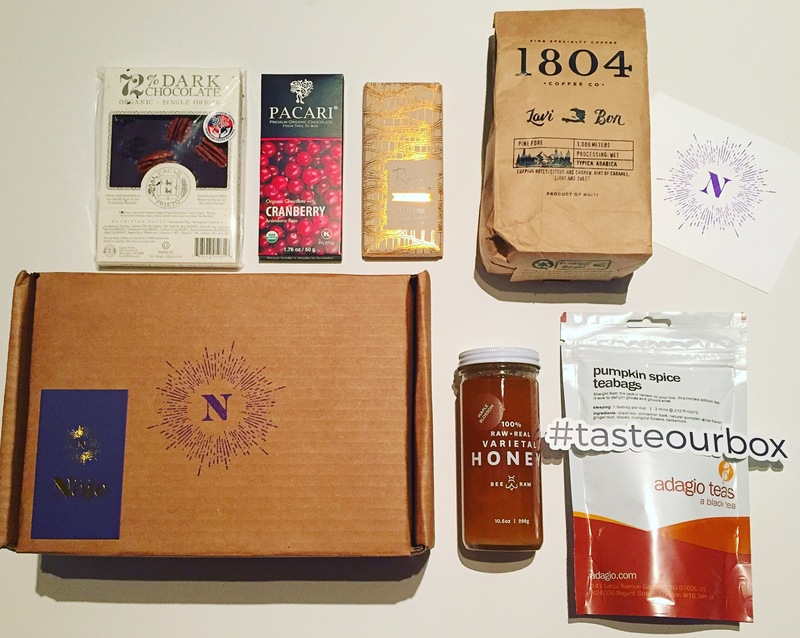 1804 Coffee Co. pine fore Haiti coffee – loving this box more and more, has everything you need and so much of it! Massive bag of coffee beans here, mmm and they smell great! 4. Cacao Prieto dark chocolate – massive bar with pecans and cherries, ermergerd so good, love this one! 5. Pacari chocolate bar – chocolate time galore here with another bar with cranberries this time. 6. Raaka apple pie chocolate bar – mmm a fav for sure with this one, never heard of an apple pie bar and was pleasantly surprised.